fprint is featured in the November 21 edition of LWN, which should be helpful in spreading the word further! Torkild Retvedt contributed a logo, which you can see above. I’m happy to consider further logo submissions, but I do like Torkild’s and it will do very nicely for an initial project logo. Thanks Torkild! Patrick Guignot spotted the LWN article, did some further research, and then published an article about fprint on linuxfr.org. I have only seen the google translation, but I must say, translation artifacts aside, that is an extremely well written article which has hit on exactly what I’m trying to achieve. I’ve written to Patrick to see if he’ll translate it into English or give me permission to find someone else to do so – I will publish any results here. Update: Patrick doesn’t know English well enough to write his own translation. Any French-speaking volunteers who wouldn’t mind spending some time translating this into English? libfprint v0.0.3 adds support for the Authentec AES1610 found in various common laptops/tablets, contributed by Anthony Bretaudeau. These fingerprint readers only see a small area of the finger so imaging performance isn’t great, but it is usable! pam_fprint v0.2 adds an enrollment application contributed by Vasily Khoruzhick, and has been fixed not to activate itself for logins over SSH. fprint_demo v0.2 and v0.3 add various bits of functionality: enrollment GUI, image saving functionality, plus the ability to count and plot detected minutiae points. 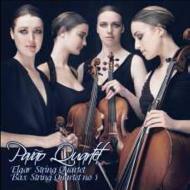 Following the success of Someone to watch over me, The Pavao String Quartet have released 2 new albums as of today. Kerenza, the lead violinist, is a relative of mine. The first, titled “A Christmas Collection”, is a collection of Christmas carols uniquely arranged for the quartet by Carlo Martelli. At £6.99, it makes for an ideal Christmas gift and £1 of each sale goes to the Breakthrough Breast Cancer charity. Buy from Amazon or hmv.com. The second album release of today features performances of two classical quartets composed by Bax and Elgar. It is released in celebration of Elgar’s anniversary. Buy it from Amazon.co.uk or HMV. The fprint project has kicked off to a good start. Thanks to everyone who provided feedback so far. Any extra help spreading the word is much appreciated! Immediately after the initial release, Vasily Khoruzhick contributed a fix for my aes2501 driver, as his is mounted in his laptop 180 degrees rotated, it’s upside down (actually I’m not sure which way round mine is supposed to go, but thanks to Vasily it now works either way). I also modified the aes2501 driver to perform fewer USB transactions, resulting in much improved image quality and overall scanning experience. Jan-Michael Brummer contributed a driver for the UPEK TouchChip fingerprint sensor (USB ID 0483:2015) found in the Samsung P35 laptop. Jan-Michael indicates that the image processing performance is good but not brilliant. libfprint v0.0.2 has been released with the above changes and a few others. Gentoo ebuilds for all released fprint components can be found here. If you’ve been following my previous work with DigitalPersona fingerprint readers on Linux, you’ll be aware that what was an active and exciting project was reduced to almost nothing when it became apparent that open source fingerprinting code was possibly in conflict with U.S. export control laws. Well, after studying the export control documents in detail, I discovered that these restrictions simply do not apply. I decided to propose my 3rd year university project as an open source software project to really sort out the state of fingerprinting on Linux. This project is now underway. For an overview, look at this poster. The core project component, libfprint, aims to make it easy for application developers to add fingerprinting support to their applications – be it imaging or verification (or in future, identification). libfprint strives to provide you a single API for manipulating fingerprint readers in the most generic of fashions. Internally, a variety of different devices are supported through a driver-like abstraction. These devices do differ tremendously, but libfprint works to wrap that up so that as an application developer, you don’t care what type of device the user has plugged in. As this is an academic project, it was necessary to keep development closed while I implement the fundamentals myself. I’m now at a point where I’m able to release this as open source and accept contributions in the normal way. I plan to keep this project going beyond the academic project schedule and I’d love to see a community forming. In the long term I’m aiming for inclusion with major distros, integration into desktop environments, etc. Authentec AES2501 – an imaging device, swipe sensor, works well (requires a little extra care while scanning). Authentec AES4000 – an imaging device I haven’t really played with before. Image quality isn’t that brilliant, but it’s good enough for fingerprint login if you’re careful. I’m very happy with the project so far. I’m pretty sure I’m the first person to fully implement open source fingerprint login for the DigitalPersona devices, the AES2501, and the AES4000, plus I’ve done it in a generic way which interchangeably works with all supported devices. Please direct all questions/bug reports to the mailing list, please don’t use the comment form on this post for anything other than comments.